Constantius, his radiate, draped an cuirassed bust right. Minted at the 4th officina Δ (Delta) in Rome 297-298 A.D. during his reign as Caesar under Maximianus. hinterlassenen Sammlung und Aufzeichnung des Herrn Paul Gerin" (Voetter-Gerin), Rome, Constantius Chlorus, p221, nr 34. Sear, D.R., "Roman Coins and their Values" (Sear RCV Millennium Edition), Vol. 4, p256, nr. 14112. Van Meter, D., "Handbook of Roman Imperial Coins", p280, nr 34. 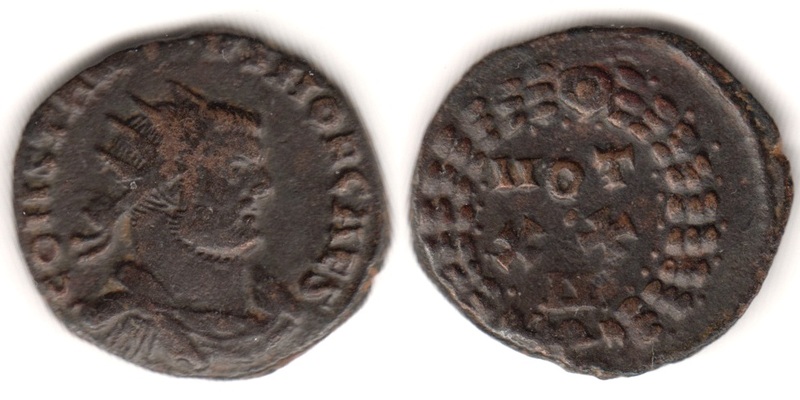 Suarez, R., "ERIC II - The Encyclopedia of Roman Imperial Coins" (ERIC II), p791, nr.925 corr, (B44, O10, R118, T120, M11). Cohen, H, "Descriptions Historique des Monnaies frappees sous l'Empire Romain" (C), Volume 7, p91, nr. 337.